T-Racks Opto Compressor, Software compressor from IK Multimedia in the T-Racks series. IK Multimedia's T-Racks Opto Compressor is a plug-in found in the T-Racks 3 mastering software, and is also available as an individual plug-in for Pro Tools and other formats. 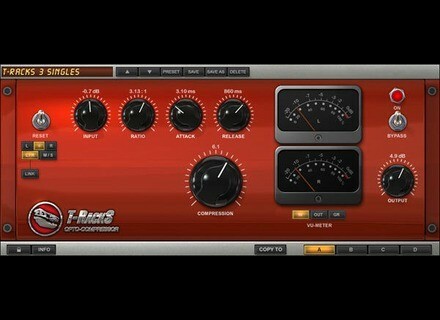 I've used the plug-in within T-Racks 3, as I own the whole software and didn't purchase the plug-in as as single. You can however, use each of the individual plug-ins in Pro Tools as a standard plug. I didn't install this on it's own, but I didn't have any issues when it came to installing T-Racks 3. The interface of the Opto Compressor is pretty simple, and those with experience with compressors will recognize all of the parameters available here. There are knobs for controlling your input and output levels, ratio, attack, release, and compression. Each stereo channel has it's own meter, which are programmable to monitor either input, output, or gain reduction. You can use the plug-in either as a stereo pair or use each channel individually. A manual isn't necessary for this plug-in in my opinion. Right now I'm running the IK Multimedia T-Racks Opto Compressor plug-in and T-Racks 3 on a Mac Book Pro that has a 2.2 Ghz Intel Core 2 Duo processor and 4 GB of RAM to work with. I've run the plug-in both in Pro Tools LE 8 and in T-Racks 3 as a standalone piece of software. While I sometimes have an occasional problem with T-Racks 3 as a whole, this plug-in itself has never presented any issues for me related to performance. It does take up a good amount of processing power for sure though, but knowing this I didn't run it as hard as I might have another smaller plug-in. How fast a plug-in will run solely depends on your personal system, but unless you have a really fast system you probably won't be able to run one of these on every track. Los Teignos's review (This content has been automatically translated from French)" Simple, effective and transparent ..."
No problem with the installation of a Serial and key formats supported on Mac and PC. Core i7, 16 GB of RAM running Windows 7 with Studio One: no stability problems or performance. I use it for two years, and vis-à-vis the 670 I used to color the sound, I use this opto logically to work on the dynamics of how much more transparent, often voices. What I like most is the simplicity and effectiveness of the plug. It makes the job unless I break my head, and does it well.